Holding a play date is a wonderful way for you to provide your child the opportunity to have fun with a friend and at the same time gain valuable insight on how your child socializes. Just as you want to know where your child is academically at school, it is even more important to know where you child is socially and emotionally with peers. You want try to set the stage for success so the children have positive associations with each other. A discrete period of time helps prepare both children of the expectation beforehand and is also easier for the other parent to schedule. Keep the get-together short. Two hours is recommended for plenty of time for play. No matter how much begging the kids may do, stick to your predetermined time. There will be the inclination to extend the play date if it’s going well. 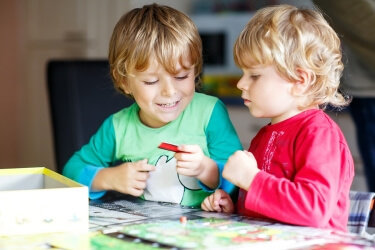 Perhaps it’s the first time your child’s connecting with a friend and you really want to let them keep playing. Just remember that kids will most likely ask to extend the time when they are at their pinnacle of having fun. Ideally, the play date should end on a high note before they get a chance to get bored. This will leave the children wanting to get together again. The expression “the more, the merrier” is not really true for playdates. Although get-togethers with a few friends can be fun, they are also riskier. They can lead some kids just blending in the crowd instead of really connecting with one another. Additionally, more children equals more to manage, more potential for someone to feel excluded and less quality time with each friend. It’s best to keep it to one child. You don’t want to have your child competing for attention at his own play date. Avoid meal times. Allergies, dietary restrictions and just plain picky eaters can cause unnecessary stress. Checking in with the other child’s parent about a possible light snack is easier and just as effective for making sure no one becomes “hangry.” Not serving a meal also makes a more logical way to end the play date. You can schedule it mid-morning and end before lunch or after lunch and end before dinnertime. Do a quick scan of your child’s room, ensuring he is OK sharing all the toys that are within sight. Put away any toys he does not want touched or would have difficulty sharing. Take a cursory inventory of the available toys to make sure that they lend themselves to non-competitive cooperative play. Legos, arts and crafts, and toys for pretend play are all safe choices. Somewhere between helicopter parent and “You’re on your own” lies a healthy balance of parenting that is involved and aware of what is happening with the friend but not dictating what the kids are doing. Make sure to go in and out of their play area to overhear what the kids are saying and how they are interacting. You may need to suggest and set up a game or activity for them to do. Once they get going with it, step out for a while and then check back in at a later time. Praise kind behavior when you see it and gently help them work out differences when needed.